A scene layer is a type of layer which is optimized for displaying large amounts of 3D data in a scene. Scene layers are used across the ArcGIS platform in applications like Scene Viewer, ArcGIS Earth, and ArcGIS Pro. A scene layer displays one of four data types: points, point cloud, 3D objects, or an integrated mesh. The scene layer complies with the Indexed 3D Scene layer (I3S) format. The I3S format is an open 3D content delivery format used to disseminate 3D GIS data to mobile, web and desktop clients. In ArcGIS Pro, you can combine scene layers with other content. For example, you might make a scene layer partially transparent, or swipe scene layers to visualize a scene with and without 3D content. To snap to scene layer features, enable snapping and hover near a feature; the pointer snaps to geometry that corresponds to the enabled snap agents such as the endpoint of a line or a point. When shared to ArcGIS Enterprise or ArcGIS Online, a scene layer becomes a web scene layer. Scene layers are cached in order to improve drawing performance. The cache contains different levels of detail (LODs); which LOD is used depends upon the distance at which the data is being viewed. This means that when you zoom out and increase the distance to your features, the complexity of the 3D data is decreased as well. For example, when viewed from far away, the visual quality of a building may be reduced but will increase as you zoom in. ArcGIS Pro writes the current I3S format. A point cloud scene layer package that was created in the latest version 2.x will work in ArcGIS Pro 2.1.2 and 2.2, ArcGIS Enterprise 10.6.1 and ArcGIS Online. A point cloud scene layer package that was created using version 1.x of the I3S format will work in all clients. Upgrade your ArcGIS Pro version to be able to consume all scene layers created from all versions of ArcGIS Pro. In previous versions of ArcGIS Pro the Create Scene Layer package geoprocessing tool was used to create all point, point cloud and 3D object scene layers. This tool has been deprecated and replaced with Create Point Scene Layer Package, Create Point Cloud Scene Layer Package and Create 3D Object Scene Layer Package . Depending on how they are shared, web scene layer representing points or 3D objects may additionally contain an associated feature layer representing the system of record that the scene layer cache is derived from. If a web scene layer does not contain an associated feature layer, the scene layer cache is created by publishing on the client or a scene layer package (.slpk). Point clouds and integrated mesh web scene layers can only be derived from scene layer packages. Web scene layers that have an associated feature layer provide dynamic statistical information that can be used for symbology or definition queries. When you access the attribute table of the scene layer, the table from the associated feature layer, the system of record, will be displayed. When updates are made the scene layer can be rebuilt to reflect the changes. For more information, see edit scene layers with associated feature layer. Web scene layers with associated feature layers are shared from ArcGIS Pro by selecting the option to cache on the server when configuring the web scene layer. For more information on sharing web scene layers, see Web scene layer. A scene layer package (.slpk) contains the scene layer cache that can be published as a web scene layer. Use the Validate Scene Layer Package geoprocessing tool to evaluate a scene layer package file to determine its conformity to I3S specifications. Web scene layers generated from a scene layer package are shared from ArcGIS Pro by selecting the option to cache locally when configuring the web scene layer. For more information on sharing web scene layers, see Web scene layer. They can additionally be shared using the Create Building Scene Layer Package, Create Point Scene Layer Package, Create Point Cloud Scene Layer Package , Create 3D Object Scene Layer Package , Create Integrated Mesh Scene Layer Package, and the Share Package geoprocessing tools. A 3D object scene layer can be used to represent and visualize objects such as buildings that are explicitly modeled in three dimensions. A 3D object scene layer is typically used to create large city models that can be shared. The objects can be displayed with textures or with color symbology depending on the content that is being visualized. 3D object scene layers are true 3D objects and only absolute height can be defined in the elevation properties. An example of point and 3D object scene layers. A 3D object scene layer can be shared as a web scene layer either with an associated feature layer or from a scene layer package (.slpk). For more information on sharing web scene layers, see: Web scene layer. Additionally, a 3D object scene layer can be created using the Create 3D Object Scene Layer Package geoprocessing tool, which generates a scene layer package on disk (.slpk). This file can then be previewed directly inside ArcGIS Pro, and then uploaded to ArcGIS Enterprise or ArcGIS Online using the Share Package geoprocessing tool to be published as a web scene layer. Building scene layers allow you to share building information across the ArcGIS platform. Building information is derived from a BIM (Building Information Models) representing buildings. In the current release, you can use Revit data to create a building scene layer. An example of a building scene layer. A building scene layer can be created using the Create Building Scene Layer geoprocessing tool, which generates a scene layer package on disk (.slpk). This file can then be previewed directly inside ArcGIS Pro, and then uploaded to ArcGIS Enterprise or ArcGIS Online using the Share Package geoprocessing tool to be published as a web scene layer. Three-dimensional mesh data is typically captured by an automated process for constructing 3D objects out of large sets of overlapping imagery. 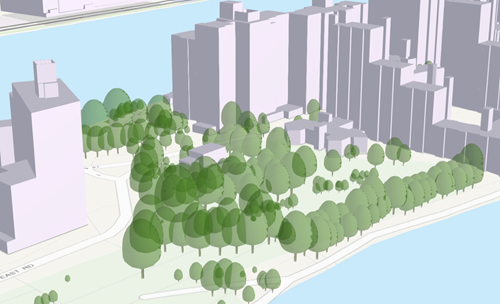 The result integrates the original input image information as a textured mesh including 3D objects, such as buildings and trees, and elevation information. Integrated mesh scene layers are generally created for citywide 3D mapping. They are often captured by drone and cannot be restyled. An integrated mesh scene layer can be created from OpenSceneGraph Binary (OSGB) files using the Create Integrated Mesh Scene Layer Package tool. An example of an integrated mesh scene layer. When an integrated mesh in a projected coordinate system is added to a scene, it is added in local view with the basemap and default elevation source removed. An integrated mesh with a geographic coordinate system, such as WGS84, is added to a global scene with both the default basemap and elevation source. Point cloud scene layers provide fast display of large volumes of symbolized and filtered point cloud data. They are optimized for the display and sharing of many kinds of sensor data, including lidar. Point cloud scene layers help share 3D point cloud content across the platform. A point cloud layer can be shared as a web scene layer from a scene layer package (.slpk). For more information on sharing, see Web scene layer. Additionally, a point cloud scene layer can be created using the Create Point Cloud Scene Layer Package geoprocessing tool, which generates a scene layer package on disk (.slpk). This file can be previewed directly inside ArcGIS Pro, and then uploaded to ArcGIS Enterprise or ArcGIS Online using the Share Package geoprocessing tool. A point cloud scene layer supports point cloud data in LAS, Optimized LAS (.ZLAS), LAS dataset, and LAZ format. Individual files and folders of LAS, ZLAS, and LAZ files can also be used as input to the Create Point Cloud Scene Layer Package tool. A LAS dataset that references LAS and ZLAS files can also be used to create a point cloud scene layer. Any symbology and point filtering that has been applied to the points of a LAS dataset layer will be used to create the point cloud scene layer. A default elevation symbology and no point filtering will be used to create a point cloud scene layer when individual files or a folder of files (LAS, ZLAS, LAZ) is used as input. To optimize the point cloud data and define properties such as symbology and filtering, use the LAS dataset as input. To ensure fast visualization in all clients, cached point scene layers are used to display large amounts of point data in ArcGIS Pro and a web scene. For example, you can use a scene layer to display the trees in a city using preset layers. A point scene layer can be shared as a web scene layer either with an associated feature layer or from a scene layer package (.slpk). For more information on sharing web scene layers, see Web scene layer. Additionally, a point scene layer can be created using the Create Point Scene Layer Package geoprocessing tool, which generates a scene layer package on disk. This file can be previewed directly inside ArcGIS Pro and then uploaded to ArcGIS Enterprise or ArcGIS Online using the Share Package tool to be published as a web scene layer.